While I have been reading instead of playing, the most exciting news in computer gaming has been Go. Chess-playing computer programs have gradually moved from “plays a standard game pretty well” to “almost competitive with a good human” to “consistently beats world champions,” reaching the end of that progression about a decade ago. Go, contrarily, has long been held out as a game at which computers will have trouble making gains because the search space is huge for a 19×19 board, moves have long-term consequences that make evaluating individual moves difficult, and play has generally been seen as more intuitive and so less open to computational brute force. A year ago, the best Go program was competitive against a good amateur player. In the last six months, Google Deepmind’s AlphaGo has leaped to “best in the world,” beating the European champion 5-0 and now beating the world champion 3-0 with two games to go. There are three things I would like to note here. First, the speed of that jump is ridiculous. 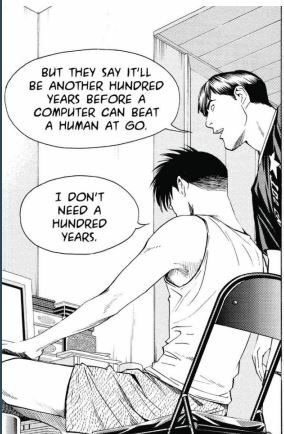 Go has long been one of those “at least a decade away” computing problems, like the ones that have been forecast as “20-30 years away” for the last 20-30 years and are still 20-30 years away today. AlphaGo is the first computer program to beat a professional player without a handicap, and then it went on to beat the world champion. That is going from “can’t beat a professional player” to “beats the top professional player” in one step. This is not the gradual progress we saw with computers and chess over decades, this is an escalation in power levels that would make anime blush. Second, this is not simply a matter of Google having massive computing power to throw at the problem. The chess world champions play on supercomputers and evaluation trillions of positions per second. The world champion version of AlphaGo uses a distributed computing network, but they also have a single-computer version that beats the distributed version about a quarter of the time. We will see if the human world champion gets one win in the series, but this suggests that a much less powerful version of AlphaGo would still be a top player. Bonus thought 2: when I see Eliezer referencing “Path to Victory” in that post, I cannot help but see him referencing Worm, which he has read and commented on before.